At just 17 years, Andrew Blair went to sea, entering into a four-year Covenant of Indenture with Peter James Hughes of Dunedin. Mr. Hughes was a servant of Henry Guthrie, the registered ship owner of the barque Laira. The Covenant of Indenture was handwritten, signed and witnessed on 14 January 1889. "In 1891 the Laira had an exciting race with the Glasgow barque Oban Bay. Both boats were lying at Oamaru, loaded with wool, and ready to sail for London. A challenge was thrown out by the Laira, and quickly taken up by everyone on board the Oban, even the youngest apprentice having his "bit" on" (White Wings Vol I. Fifty Years Of Sail In The New Zealand Trade, 1850 to 1900). During the race heavy conditions damaged the Laira's topmast which was replaced after the unlikely discovery of a perfectly sized, barnacle encrusted pitch-pine log floating at sea. At the very close of Andrew's indenture period, on September 1 1892, Peter James Hughes was killed in Perth when a load of falling timber crushed him. The Laira had arrived from Hobart where the ship needed extensive repairs after enduring extreme weather (Auckland Star, Volume XXIII, Issue 211, 5 September 1892, Page 3). Both the ship's owner and her master were obliged to add to the Covenant a sworn statement affirming that Blair had completed the full term of his Indenture under Gordon MacKinnon, the ship's master and later captain. Basic training complete, he went on to get his Certificate of Competency in April 1897. Five years later he had mixed results, failing a Navigation Certificate in January but gaining a Certificate of Competency as Master of a Foreign-going Ship, a Merchant Navy Master. Blair joined his mother Martha who was visiting Scotland in July 1900. Martha met with the Presbyterian community and no doubt spoke of her daughter Jessie Blair, who had the year before begun missionary work in India. Unknown to either Martha or Andrew, Jessie was gravely ill with Typhoid and would die in October that year. Martha "got the news of her death while returning from Glasgow on the SS Perthshire, on which her son, Jessie's brother John, was an engineer" (Jackie Brown's private blog accessed 2013 10) . An album of that holiday was gifted to Martha by her niece. In September of 1903 Andrew gained his Certificate in Competency as Master of Square Rigged Vessel. Blair worked for the Clan Line, a growing line of steamers which would soon become the dominant company carrying passengers and cargo around the Persian Gulf and North America. This likely included commanding ships in and out of Aden, something he first began in 1906 and finished in 1928 (Otago Daily Times obituary). In 1907 he is photographed with a cousin at the launching of the Lusitania in Glasgow. The Lusitania was launched by the Cunard Line and probably represented the competition to Clan Line in an already overcrowded North Atlantic trade. Months after the outbreak of war in 1914 Blair signed up for service and was commissioned at the rank of Lieutenant (December 10). By this time he was already 41 years old, a decorated and seasoned Merchant Navy captain experienced with tall sailing ships as well as the modern steam engines of the era. This breadth of experience would later stand him in good stead for a covert form of resistance needed to counter the threat of modern submarine warfare. His first order of business, however, was to serve as Lieutenant aboard H.M.S. Defiance, a torpedo and wireless school ship. After going through the sweeping course he was appointed leader of a unit of six patrol trawlers, including the Trawlers "Urania" and "Pearl" based at Pembroke Dock, Milford Haven in the SW part of England. He led the unit from January 1915 to October 1916. 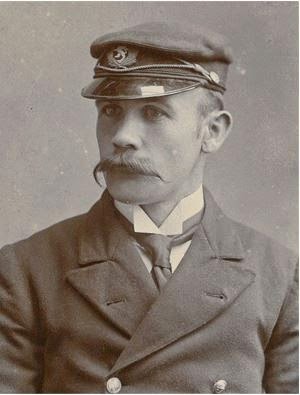 At the conclusion of this service Vice Admiral Charles H. Dare wrote that he had "conducted himself to my satisfaction - a zealous & efficient officer as leader of a unit of trawlers". Towards the end of this period the Royal Navy captured the German ship Aud which was smuggling munitions to support the Irish Volunteers who were about to attempt an overthrow of British rule in Ireland. But it wasn't all smooth sailing for Blair. In March on 1915 he was reprimanded for grounding "Urania" and warned by the Commander in Chief to be more careful (Military Record). On June the 28th he was reported to be suffering from acute alcoholism and temporarily discharged from the R.N.R. for misconduct (Military Record). His commission was returned to him in September, either before of after his marriage to Lillian Harvey. Blair, now almost 43 years of age married the 20 year old daughter of ship's carpenter John Henry Harvey in September of 2015, the same month his commission was returned. Whether this marriage contributed to him 'sorting himself out' is unknow. Lillian Patricia Edith Harvey was, according to their marriage certificate, residing at 249 Cherrywood Road Bordesley Green in Birmingham. Blair was living in temporary accommodation at the Imperial Hotel Birmingham. Curiously he records his age as 40 on the marriage certificate and although Lillian claims to be 20, family lore has her as young as 17 years of age. The marriage, sadly, was not to last. After the war his daughter Dorothy Jessie Blair was born (1922) and she was we think the third child of theirs. Dorothy was my maternal grandmother (at right of photo) and the only child of Andrew and Lillian that would survive. Family lore has it that he took Dorothy away from Lillian and had his sister, raise her in New Zealand for fear she wouldn't survive either. Information from other descendents indicate this was Florence (Flossie) who had married Will Sproat (first Headmaster of Dunedin North Intermediate) and had a daughter (Joyce). Shipping records confirm that Blair left from London aboard Beltana with his 6 year old daughter Dorothy for NZ in 1928. They did get off in Sydney and must have completed the trip later. "Research Harley Couper, Tauranga City Libraries"